Up for your consideration is this 2016 Trump Dollar 1 ounce. 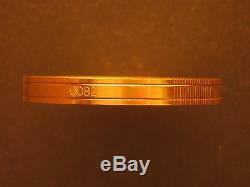 9999 gold (Double Split Piedfort), 1 ounce. 999 silver & 1 ounce. 999 copper 3 round coin proof set with mint packaging and certificate of authenticity. THESE ARE EXTREMELY LIMITED ROUNDS SO GET YOURS NOW WHILE THEY ARE STILL AVAILABLE! 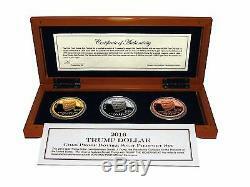 The stunning gold proof Trump Dollar set consists of the first ever gold Double Split Piedfort proof in addition to a fine silver proof and a pure copper proof. All three specimens are minted with a special ultra high relief obverse die in flawless proof condition. Due to the demanding nature of minting the unique gold Double Split Piedfort that are individually minted upon demand per your order and the higher than usual reject rate due to the unique minting process, please allow up to 30 days for your custom order to be minted expressly for you. The proof set contains three specimens: 1 A special two ounce Double Split Piedfort gold proof Trump Dollar with two half-ounce. 9999 fine gold planchets sandwiched with a gold layered one ounce of. 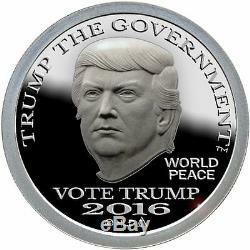 999 fine silver planchet in the center, 2 A proof silver Trump Dollar with one ounce of. 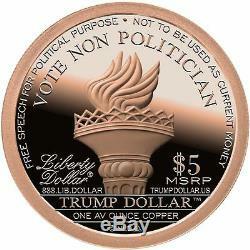 999 fine silver and 3 A proof copper Trump Dollar with one AVDP ounce of pure copper. All three proofs are minted with eight strikes by the proofing press and a special Ultra High Relief (UHR) obverse die to create a flawless mirror-like Proof finish that cannot be confused with the lower relief, satin-like finish on the Brilliant Uncirculated Edition. Each proof specimen is packaged in tamper proof capsules and secured in a laser engraved wood display case with a Certificate of Authenticity. Please read the Double Split gold Piedfort story below for more info. Please note: As each gold Piedfort set is individually minted per your order, so please allow up to 30 days for your custom order to be minted expressly for you. The Double Split Gold Piedfort Story. By Bernard von NotHaus Monetary Architect. The problem with minting a 39mm one ounce. 9999 fine gold proof is that as gold is denser than silver or copper, the most expensive specimen in a three coin gold set, is always smaller. That problem has always been an eyesore for me. I always wanted all three specimens to be the same size and have the same quality. Technically, the problem is that a one ounce gold planchet is so thin it limits the relief of the gold die to being very shallow and eliminates using an Ultra High Relief (UHR) die completely. So while the UHR die works for the silver and copper, it does not work for the gold proof. The solution to this mint dilemma was to invent a new mintable item. Based on my two previous piedforts: the 39mm two ounce silver Liberty Dollar Piedfort in 2004 and the two piece quarter ounce Liberty Dollar Split Piedfort in 2006, I invented the 2016 gold proof Double Split Piedfort for the Trump Dollar gold proof set. The gold proof Double Split Piedfort is a unique coin structure with three planches: half ounce. 9999 fine gold planchet on the bottom, gold clad one ounce. 999 silver planchet in the center and a half ounce. 9999 fine gold planchet on top. All three planchets are minted at the same time with an UHR obverse die and voila a stunningly gold proof Double Split Piedfort is created so the gold proof set has three proofs in gold, silver and copper that are all the same size and all struck with the same UHR obverse die. The 2016 Trump Dollar gold proof Double Split Piedfort set consists of one ounce of. 9999 fine gold, two ounces of. 999 fine silver and one AV ounce of pure copper. It was engineered to be the best, most innovative and most unique, commemorative coin set for an equally innovative and unique Presidential Candidate Donald J. Piedforts are an old European tradition, dating from the late 13th century in Bohemia. According to recent "encyclopedic dictionaries" by Richard Doty and R.
Scott Carlson, other early minters of these special productions included France, Germany and England. A Piedfort, French for "strong foot, " is a special minted coin or medal on an unusually thick planchet, usually twice the thickness of the normal issue. Different reasons for piedforts have been advanced with the most accepted reason being to show examples of an engraver's work or to provide added thickness for striking ultra high relief coins. France started producing modern day piedforts of its circulating coins in 1967 and continued such offerings regularly through the 1970s. In the 1980s, Carlson notes, there was an upsurge in popularity of piedforts among collectors. France offered piedforts of the silver 100-franc commemorative for the 100th anniversary of the Statue of Liberty. In addition to piedforts being double thick, "split piedforts" have been minted with two planchets and on special occasions piedforts have been minted in precious metals rather than the base metal of circulating coinage. In addition to European countries, US Mint has shown no reluctance to mint its own piedforts with variously packaged sets, reverse proof coins and other exotic numismatic issues to the cheers of many collectors. Thank you very much for looking at our listings! The item "2016 Trump Dollar 1 oz Gold (XTRA RARE), Silver & Copper 3 Round Coin Proof Set" is in sale since Saturday, July 30, 2016. This item is in the category "Coins & Paper Money\Coins\ US\Collections, Lots". The seller is "lspmex" and is located in Texas. This item can be shipped to United States.